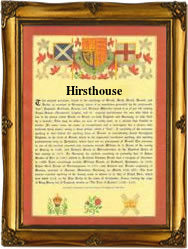 Recorded in the spellings of Hurst, Herst, Hearst, Hirst, and locational names such as Hirsthouse from Hurst House in Sussex, this is an English surname. It is either a topographical for someone who lived on a wooded hill, deriving from the Old English pre 7th century word "hyrst", or as a locational name from one of the various places called Hurst, in Berkshire, Kent, Somerset, and Warwickshire, or Hirst in Northumberland and the West Riding of Yorkshire. The surname dates back to the late 11th century (see below), and further examples of early recordings include Helias de Hirst of Yorkshire in the cecords of the Knight Templars of England in 1177, and that of Walter del Hurst in the Pipe Rolls of Buckinghamshire in 1236. Amongst the many interesting examples of recordings is that of Tobias Hurst. He was one of the earliest emigrants to the the American colonies of New England where he is recorded as living in "Elizabeth Cittie", Virginia, in early 1624. He arrived on the ship "Treasurer of London" in 1618, which was two years before the famous Pilgrim Fathers on their ship "Mayflower" in 1620. The first recorded spelling of the family name is shown to be that of Thomas de Herst. This was dated 1086, in the famous Domesday Book of England, during the reign of King William 1st, known as "The Conqueror", 1066 - 1087. Surnames became necessary when governments introduced personal taxation. In England this was known as Poll Tax. Throughout the centuries, surnames in every country have continued to "develop" often leading to astonishing variants of the original spelling.